Join us on an aerial tour of all eight counties of Western New York. 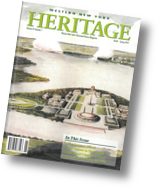 We conclude our look back over the past 20 years of Western New York Heritage magazine with a survey of some of the many historical stories that have graced our pages. Milkman, keep those bottles quiet!! We take a nostalgic look back at the local dairy industry, while examining the factors behind its meteoric rise...and fall. Three-quarters of a century ago, the United States was drawn into the Second World War following the Japanese attack on Pearl Harbor. Archival documents chronicle the impact of these turbulent years on Western New York. Gates Circle has witnessed, not only a name change, but also a whole renovation in its lifetime. These two houses sit right across the street from one another and were both home to noteworthy families. Many of the homes along Buffalo's famous parkways and circles have rich histories and this home on Soldier's Place is no different. The Allegany School of Natural History was an interesting partnership between the Buffalo Society of Natural Sciences and Allegany State Park. Here we share some images from these early 1920s camps.